Surfing, snorkeling, biking and playing volleyball are just a few of the fun things you can do while visiting San Diego’s beautiful beaches. Well, now you can add another fun activity to the list: Clam digging! If you’re thinking, “Clam digging in San Diego…really?” Think again. Clam digging is fun for the whole family and is quite popular on several San Diego beaches. Nestled along the shoreline, deep in the wet sand, you can find Pismo, and sometimes Razor Clams. Some people use a small shovel or rake to dig them up, but it’s definitely more fun and just as easy to use your hands or the heels of your feet. Just wade out into the shallow water and start digging. 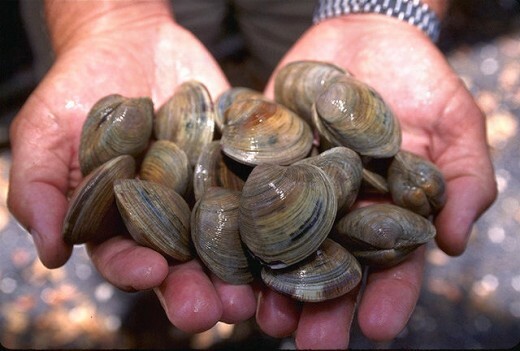 The best time to go clam digging is at low tide, so check the tide tables before setting out. And each beach usually has limits on the size and how many clams you can catch, so be sure to confirm first. Silver Strand State Beach is a great family beach on Coronado and is named for the silvery seashells found on the park’s seaward side. Pismo clams are quite common here. Mission Bay at Crown Point Park, located at the intersection of Ingraham Street and Crown Point Drive. This is a great place to dig for clams on low-tide summer days. If you have a favorite spot already, let us and others know about it in the comments below. This entry was posted in Family Vacations, Outdoor Adventures and tagged clamming, clams, San Diego by Denise. Bookmark the permalink. I dug up a clam yesterday right at Clairemont, by the park. Do you have to have a permit? License?